When I play an a on my violin I can hear, not only the basic frequency 440hz, but also, more or less, its overtones. A year ago I had never before thought about how all these overtones also exist around us and how they manipulate how we perceive a tone from a violin or even our own voice. Without this swarm of different frequencies we could never separate a trumpet from an organ, a male voice from a female one, or the vowel a from the consonant b. I would not have been able to play the violin without all overtones, since a tone with only one frequency would sound horrible. The reason for me having this insight now is, amongst other things, due to my project in school about how to hear the differences between instruments. Also, singing exercises with Kristin and Astrid have taught me how important it is to bring out all these tones when you sing. That it is not enough to just open the mouth, but also form it and listen for the result. Suddenly, music was so much more to me. I have played, talked and sung so much before but never realized it. That something so mundane as sound can be so complex. 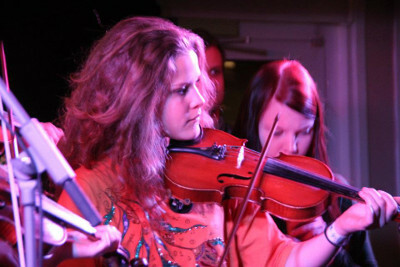 Linnea Blomgren is 18 years old, and an active member of our project Baltic Sea Inter Cult project, where youth in Sweden, Estonia and Poland learn about networking, culture & identity development, project management, etc through traditional music.